A very special TETRIS clone, the Queen of Tetrises, the TETRIS Queen, with 50 levels, 30 musics, total support for 2 player, and two modes: classic & destructor (with bombs and mega-bombs), this and much more in one free game. You've mastered Tetanus, part of freepuzzlearena. But can you perform at that game even while high on LSD? Tetanus On Drugs combines the Carbon Engine of Tetanus with a heavy dose of screen distortion. It bends, waves, spins, and zooms the playfield, making the player dizzy. It also introduces a play mode similar to Nintendo's The New Tetris; make 4x4 block squares out of pieces to earn lots of points. A good simple tetris looking game, with clean and easy user interface. 2 Game Types available - Color Style and Tetris Style, with highscore saving. More Tetris anyone? Yet another Tetrisclone with many features such as two player games and options that allow you to customize the game to fill your needs. 5 different soundtracks and lots of sfx included! A very very basic Tetris clone with some silly graphics. A very simple game which comes with all of the sources. If you want to give some advice or ask some questions pm me. 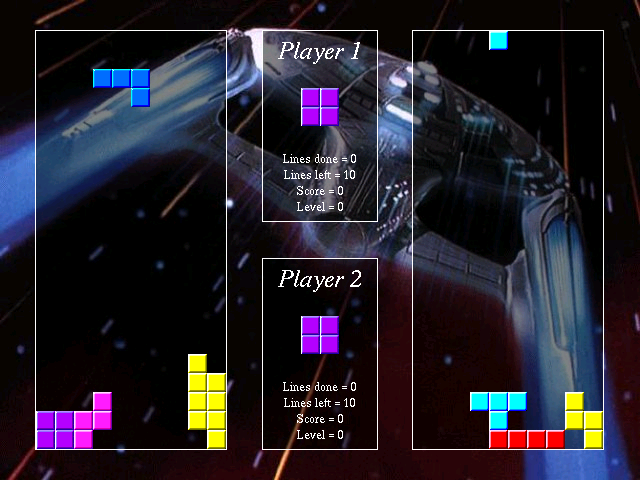 Clone of Tetris, include new mode: Versus Battle (FIGHT) for two players, test your speed!. Download more music in the website: anime music, classic music, other music. Cool! code with a lot of coments. Remember those classical Tetris that comes with great 8bits backgrounds ?? This game does the same, but in 16bits which are photo-realistic. Plus, it comes with great MOD musics as well. Again a not-so-new game, but still tetris can be fun :) I tried do some nice graphics. The game also has it's own GUI, please check it out! A fun game (at least I think =]) coded in Dev-C++ and Allegro. Its source is included in the .zip file. It has two playmodes: Classic (old Tetris®) and Custom (three new pieces). The '?' on top-left menu screen is a 'Help'. All controls are there. A simple Tetris clone. Not really much else to say. A tetris clone. No sound yet though. Also, the first game that I have implemented a highscore. Very cool style. Something new! A faithful implementation of tetris. It's pretty good looking and has no obvious bugs. In this case, the source code is more interesting than the game. It's good for a laugh, but there's not much else going for it. The style is funny, but it actually gets in the way of playing the game. You are visitor #58,669,949 since January 1999. This page has been viewed 8,770,845 times since March 2002. Page generated in 0.028154 seconds.